In this Eucharistic Year for the Diocese I am inviting us all to reflect more deeply on the mystery and reality of the Eucharist. My Advent Letter was an invitation to recognise with renewed faith and love the Blessed Sacrament of the Real Presence of Jesus Christ at the heart of all our churches. At the beginning of Lent, I want to draw your gaze especially towards the Altar where Christ’s Sacrifice, by which He loved us to the end, is made present anew (cf. Jn 13:1). In Lent we think of the many sacrifices we are all called to make; yet Saint Peter draws our attention today to the one Sacrifice by which “Christ himself, innocent though he was, died once for sins, died for the guilty to lead us to God” (I Peter 3:18). At the Altar this one Sacrifice of the Cross is made present for us anew in the offering of every Mass. As the Second Vatican Council taught, “At the Last Supper, on the night he was betrayed, our Saviour instituted the Eucharistic Sacrifice of his Body and Blood. This he did to perpetuate the sacrifice of the Cross throughout the ages until he should come again…” (Sacrosanctum Concilium n 47). Lest we should lose sight of this, the Liturgy requires that there should be “a cross with the figure of Christ crucified upon it, either on the Altar or near it … a cross clearly visible to the assembled people … so as to call to mind … the saving Passion of the Lord” (General Instruction of the Roman Missal n 308). 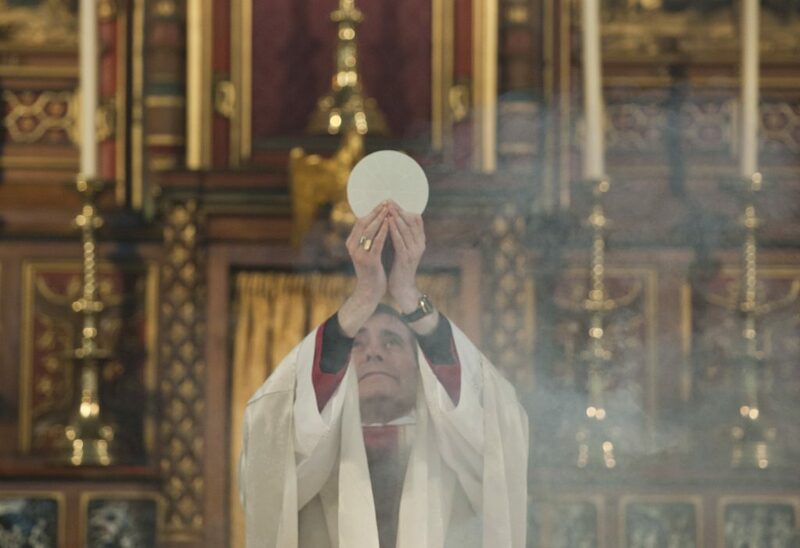 It is our Catholic faith that “Christ, God and man, makes himself wholly and entirely present” in the Blessed Sacrament of the Altar and that the Sacrifice of Christ, made once on the Cross, is truly made present and its grace applied in the Sacrifice of the Altar (CCC 1374, 1366). This, the Church’s Catechism explains, is “manifested in the very words of institution ‘This is my Body given for you’ and ‘This chalice which is poured out for you is the New Covenant in my Blood’” (CCC n 1365). Yet, we might ask ourselves whether we have allowed the Mass to become reduced in our minds to merely a communal meal and celebration rather than the paschal banquet, the supper of the Lamb of God sacrificed for us? Have we thereby allowed new generations to become bored and uninterested in the Mass, by not allowing them to glimpse the awesome reality of this Sacrifice and Sacrament? Might we also fail to appreciate why the Second Vatican Council taught so clearly that the Eucharistic Sacrifice is the source and summit of the whole Christian life because in every Mass the central event of salvation becomes really present and the work of redemption is carried out (cf Lumen Gentium n 11, 3). As Saint John Paul II explained in his last letter to the Church, “This sacrifice is so decisive for the salvation of the human race that Jesus Christ offered it and returned to the Father only after he had left us a means of sharing in it … What more could Jesus have done for us? Truly, in the Eucharist, he shows us a love which goes ‘to the end’, a love which knows no measure” (Ecclesia de Eucharistia n 11). How, then, could our hearts ever remain unmoved by this love beyond all others? At the Altar, we learn love and sacrifice not only by imitation, but we receive the grace and power to live sacrificial lives in the service of Christ and one another in all of the spiritual and corporal works of mercy. In the Eucharistic Sacrifice, we find the grace and power to live every Christian vocation which leads us to make before the Altar the promises of marriage, of ordination or of the consecrated life. This year, I pray we may each come to appreciate more deeply why Saint John Vianney declared that: “if we glimpsed for a moment what the Holy Eucharist truly is, we would die not out of fear but out of love!” In turning our gaze towards the Altar and the Cross, let us pray that we may recognise with faith and ever growing wonder the Holy Sacrifice of the Mass.